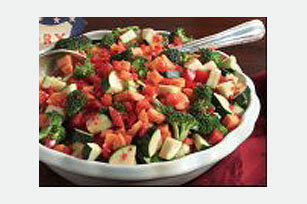 Crisp and colorful broccoli, carrots, red pepper and zucchini are tossed with red wine vinaigrette for a simply delicious chopped vegetable salad. Mix all ingredients in large bowl. Refrigerate several hours or until chilled. Prepare as directed. Toss with 1 bag (10 oz.) salad greens or 8 cups torn greens.